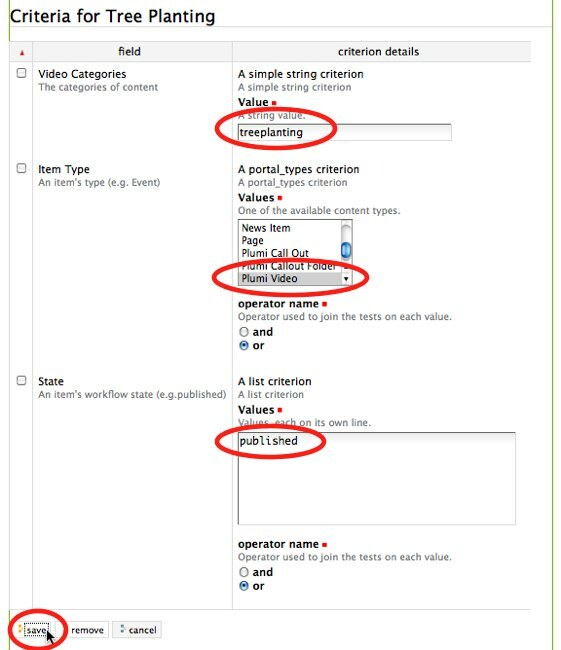 Portal vocabularies are used to define categories to describe content in Plumi, such as video topics, video genres and submission categories. 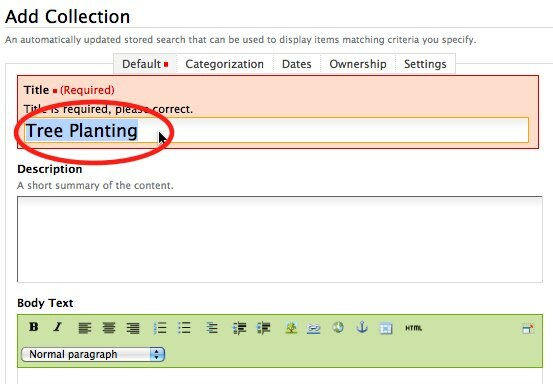 A vocabulary term is set up for that category, and then a collection is created to reference items with that category. 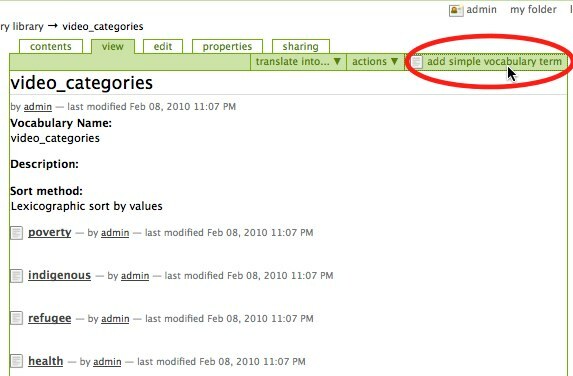 A collection is what was previously known in Plone as a smart folder, a folder that displays dynamic content based on a set of criteria. There are two methods available for adding a new video topic (also known as video category), video genre or callout category (also known as submission category). You can either set these up BEFORE or AFTER installation of Plumi. Setting these up before installing is a little easier, but both methods are listed below. Checkout the Plumi buildout as per the instructions in the installation chapter. Before running the buildout, execute the following process (between steps 2 and 3). Here you can view the dictionary vocab_set. Video categories correspond to video topics. Video genres correspond to video genres. Submission categories correspond to callout categories. To delete a submission category, video category or video genre, just delete the line corresponding to that entry. To add an entry just enter a new line e.g. Continue the installation process from Step 3. When you install Plumi, the categories/genres you have defined will be created. To make changes to the portal vocabularies, you must log into your Plumi site using the Admin account, or any user with the Manager role. Modifying the portal vocabularies after you have already installed Plumi requires a little more work. Note: configuration of vocabulary terms and collections happens in special places within the normal Plone (Plumi) user interface, not in the ZMI (Zope Management Interface) and not in site setup. Also note: an easier way to do this quickly would be to edit (or copy and paste) an existing vocabulary term, and an existing collection. In particular, setting collections up with criteria can be confusing at first, so in some way editing (or copying and pasting) an existing collection could be simpler, and give you greater chance of success. Please read through the full process below to get an idea of how these are set up, and then choose to edit existing items if you prefer. Go to /portal_vocabularies, select category/genre/submission and add simple vocabulary term. Add a new collection, give the title of your desired vocabulary term, publish and set criteria. Click add simple vocabulary term. Give your vocabulary term a key and a Value(name) and click Save. Select Collection from the add new... drop-down menu. Give your Collection a title. Select publish from the state: drop-down menu. Insert the following criterias: Video categories with Criteria type of Text, Item Type with Criteria type of Select content types, and State with Criteria Type of List of values. E.g. 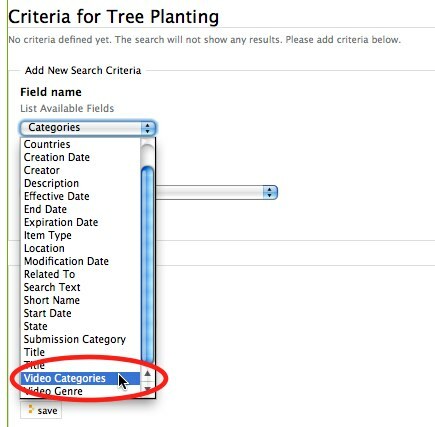 to add Video categories with Criteria type of Text, select Video categories from the Field Name drop-down menu. 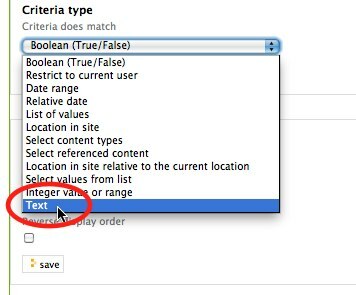 Select Text from the Criteria Type drop-down menu. Repeat process, adding Item Type with Criteria type of Select content types, and State with Criteria Type of List of values. Choose Plumi Video from Item Type, enter your new vocabulary term (MAKE SURE YOU USE THE KEY YOU ENTERED EARLIER, NOT THE VALUE/NAME) into Video Categories, and enter published in State. Click Save button. 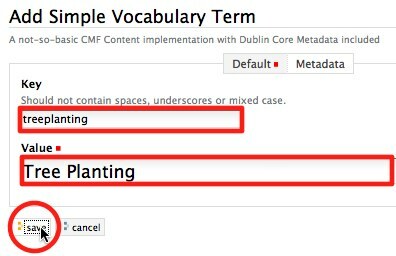 If you're going to delete a vocabulary term, make sure no video has been assigned with this term. For example, if you delete a video genre, and visit a video that is of this video genre, then you will have an error! First change the video genres of that video to remove references to the genre you wish to delete, and then delete that video genre.